So where does this leave Austen vis-à-vis romance? The Romance Writers of America says a romance must contain two elements: a central love story and an emotionally satisfying and optimistic ending. Certainly, all of Austen’s books meet the second criterion. They all end happily and satisfactorily, at least regarding the main characters. So, the question is: how well do her books meet the first criterion: a central love story? That a is a much harder question to answer and it varies according to each book. Certainly in Northanger Abbey, the love story is central. Catherine likes Tilney from the beginning, and the question of whether they will get together is the primary source of suspense. I would say this is also true of Persuasion. It is true to a lesser extent in Pride and Prejudice and Elinor’s story in Sense and Sensibility. In those stories the primary romance protagonists spend far less time together and today we tend to see spending time together as an essential part of getting to know each other and forming a romantic attachment. But in P&P and S&S the question of whether the heroine will marry the hero is still the primary driver of the plot. I do not believe that is true for Mansfield Park or Marianne’s story in S&S. (I won’t discuss Emma; it’s been a while since I read it). In my most recent re-reading of Mansfield Park I was struck by the extent to which Edmund and Fanny’s marriage was tacked on as an afterthought. While the question of whether Edmund would marry Mary Crawford and if Fanny would marry Henry Crawford occupies huge swaths of the plot, the amount of time Edmund and Fanny spend alone together is very limited, and they never discuss anything remotely romantic. My copy of Mansfield Park is 851 pages long and their marriage first comes up on page 844. The narrator mentions in a very offhand way, saying that she will not tell the reader the exact date or time of the proposal but leave it up to the reader’s imagination. I don’t know how Austen could have been more direct in telling us that the story we just read wasn’t really about Fanny and Edmund’s romance; their marriage just ties up a loose end and guarantees the happiness of the two most deserving characters in the book. In some ways it is the opposite of Northanger Abbey. 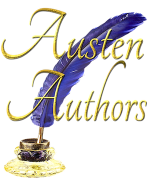 Below is a copy of a blog I wrote for the Austen Authors’ website. Enjoy! In fact, many scholars would suggest that there is a particular connection between female writers and the novel form. The history of the rise of the novel also parallels in some ways the rise of the female author. The advent of the novel made possible the publication and popularity of the Bronte sisters, George Elliot, and many other female authors who are not as well known today.